Tomaz di Cunto performs under the name Toco, which could be a diminutive or short form of his full name, but is also Portuguese for "play". He is a vocalist, guitarist and composer of breathtaking talent and has a rare ability to combine the best parts of two great genres - Brazilian samba and European jazz. Toco has been making records in Milan for the Italian Schema label but hails from Brazil. Working with the Milanese acid jazz producer Stefano Tirone, (aka S-Tone), Toco's reputation has been steadily building. If you watched the film Silver Linings Playbook, you heard “Guarapiranga”, a track from one of his previous albums. 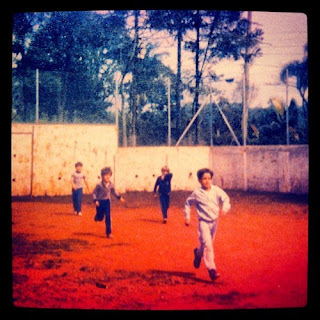 The title of the album, Memoria, refers specifically to the regions of Minas Gerais and the Brazilian northeast, its hot climate, the religiousness of the people and its faith in miracles, calling to mind images of mysterious and surreal popular tales, where time flows slowly in an intimate dimension. Toco's collaborators include Brazilian artists such as Robert and Eduardo Taufic, Mauro Martins, Edu Hebling, Marquinho Baboo, Ligiana Costa and Selton. Nina Miranda, already known to the public for her collaboration with Smoke City and Da Lata, joined this cast of amazing artists. This is the third album that Toco and Tirone have produced together. The previous collaborations were “Instalaçao Do Samba” (Schema, 2004) and “Outro Lugar” (Schema, 2007). Their collaboration results in some absolutely breathtaking music - bearing out some obviously ambitious artistic concepts, certainly... but free-flowing and full of the joy of life. This is a beautiful record - one of the best I have heard so far this year. Memoria is available now via Schema Records.